Imagine if the mapping of the interior of buildings would have benefitted from the explosive growth of navigation that has come from ubiquitous GPS receivers. Decades of GPS position and tracking data have greatly improved the mapping of our world, but unfortunately the weak signal strength of GPS have left building interiors largely unmapped. Without a free and ubiquitous position service that works indoors, we’ve only lightly touched upon the broad applications and implications for interior mapping and navigation, but inroads are being made. 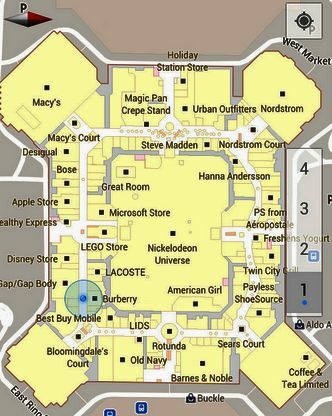 Indoor positioning is both a huge opportunity and a challenge given that we spend 80-90% of our time indoors (source: Strategy Analytics), and in dense urban areas such as Manhattan, the square footage of interiors are multiple times the size of the landmass. The difficulty navigating is also compounded by the complexity of multiple levels. 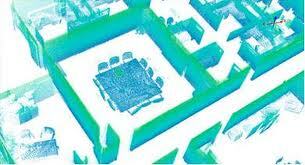 However, there are whole new dimensions of benefits for the efficient location of goods and services indoors. To meet the opportunity, a great number of institutions are conducting research with a growing number of start-up companies offering commercial solutions to a address a host of technology challenges. Google is increasingly providing indoor labels and navigation, with the ultimate goal of providing seamless navigation that act the same indoors as out. GPS position falters in dense urban areas or forests because the satellite signals don’t penetrate beyond hard obstructions and can bounce off buildings or trees resulting in too many signals (called multi-path) that degrades the precision of your location beyond a useful range. Additionally, the best precision of handheld devices such as smartphones are in the one-meter accuracy range, which is helpful when driving a car down a street, but not so useful indoors where greater accuracy is needed to find the correct door or hallway or the precise location of assets indoors. Many stronger signals have been harnessed to help triangulate indoor position, including WiFi, Bluetooth, RFID tags with beacon sensors, and even television signals. While technologies to improve the signal strength of global navigation system of systems (GNSS) have continued to evolve to provide better accuracy outdoors, we have yet to strike on a reliable and cost effective broad indoor technology, so we’re still at the first generation of technology solutions. Google has recently developed Google Maps Indoors for Android that includes both interior maps as well as the means to determine and track indoor position using WiFi by measuring and mapping the signal strength throughout the building. Google’s WiFi solution makes use of existing signals for an easy low cost solution without a need to install anything. SkyHook uses cell-tower triangulation as well as a Wi-Fi network database to determine position indoors with the WiFi accurate to 3-4 meters. 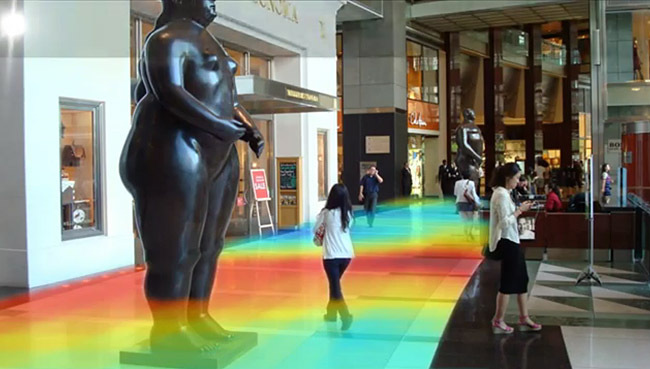 IndoorAtlas uses the magnetic sensors in smartphones to sense location within several meters using the signature of magnetic anomalies within buildings to map the unique patters of interiors. IndoorAtlas, a Finland-based company, has harnessed the patterns of the magnetic field around us to map unique locations indoors, seen here in a museum application. Nokia has harnessed Bluetooth technology to provide 0.3m position accuracy by installing positioning beacons where the mobile device measures DoD (Direction of Departure) of the signal from the beacon. Broadcom offers a special chip that takes in data from the inertial sensors on the device, wi-fi access points, bluetooth beacons, and multiple Global Navigation Satellite System (GNSS) signals to attain indoor position. Ubisense provides precise real-time location systems for tracking moving assets using ultra-wideband transmitters that signal a network of base stations that then triangulate the position with a precision of 15-30 centimeters. “Different applications will have different precision needs. There’s the generic positioning where WiFi is fine, and then there are applications where RFID or other forms of beacon technology are appropriate, and then there are the UWB-based solutions where you install those in particular types of buildings where you need to track things precisely,” said Parsons. “I think we’ll end up with a hybrid positioning model where different technologies give you more or less precise positioning, and you’ll pick one you need for your application. Nokia’s new Here service provides maps, rating and photos. The effort to map the interiors of buildings is tightly tied to the companies that provide software to digitally design those buildings. 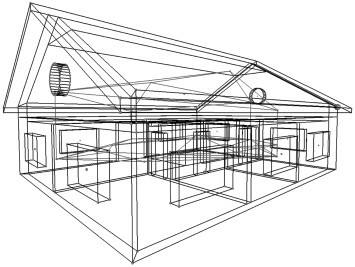 There has been a long ongoing effort to capture both floor plans, but also intelligent models that retain some of the details that went into the construction of the building, from information as simple to the locations of lavatories to the types of materials and mechanical/electrical/plumbing details that make the building tick and that require maintenance. Unfortunately, there isn’t good interoperability and sharing of information between the Computer-Aided Design (CAD) and Building Information Modeling (BIM) tools that create the models. A cross-industry effort began more than ten years ago with the establishing of Industry Foundation Classes (IFC) to document and detail the model to be shared with other models and software. That effort began back in 1994, and there has not been widespread adoption, largely due to complexity. The CityGML data format provides a means to encode and reconstruct topological connections for detailed geometric models of building exteriors and interiors. One promising standard to aid with better modeling of interiors is the City Geographic Markup Language (CityGML), which is an Open Geospatial Consortium (OGC) standard. It provides the means of describing geometric, topologic and semantic aspects of urban spaces and city models in a three-dimensional way that can include interiors and objects within the landscape. Key to the interest here is the ability to describe five different levels of detail for both general details down to precise aspects of the structure. The need to adequately map interiors, while preserving some of the intelligence that went into the building, will logically rest in the detailed drawings and modeling tools that went into creating the building. This approach certainly is the right one for new structures where fairly detailed models exist, but that doesn’t scratch the surface with all the existing buildings. Trimble offers a solution that uses both LiDAR and spherical video to create accurate and detailed maps and models geolocated positions of all features, meaning they can be tied back to their precise position. Penbay Solutions offers a service that uses LIDAR and a spherical camera on board a robotic platform that automates the data collection effort to allow just one pass through the building. Much is also being done in the research realm for Simultaneous Localisation and Mapping (SLAM) to help robots map their surroundings in real time for navigation. MIT recently unveiled a prototype chest-mounted solution that harnesses a Microsoft Kinect, laser range finder and laptop to build indoor maps in real time. Trimble’s Indoor Mobile Mapping System (TIMMS) is a manually operated push-cart designed to accurately model interior spaces without accessing GPS, instead using Lidar and a camera system. The issue of precise positioning is of interest to a wide range of mobile companies and electronics manufacturers as well. Earlier this year, 22 companies, including Nokia, Samsung Electronics, Sony and Qualcomm, formed the In-Location Alliance to pool resources for developing indoor location and mapping solutions. The indoor mapping and positioning space is beginning to heat up with new companies that are pursuing innovative approaches and actively searching for funding. It’s clear that many more startups will address different issues as we’re in the early days of development with a very large opportunity ahead that hold many possibilities for niche areas of application. [hr]This is a two-part feature. For more information on the business implications and opportunities for indoor mapping and positioning, see the companion piece, “Indoor Location Mapping: Abound with Business Opportunities,” in LBx Journal.